Ever dream about having a place to call your own? 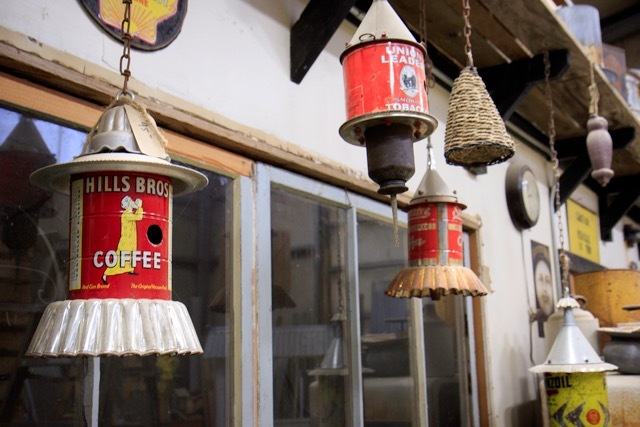 Drive around the island, and you’ll find workshops, barns, and studios that house creative tinkerers, writers, artists, and gardeners. Scattered like fairytale flowers among them are whimsical sheds, chicken coops, and garden houses built by Bob Bowling, of Bob Bowling Rustics on Bayview Road in Langley. 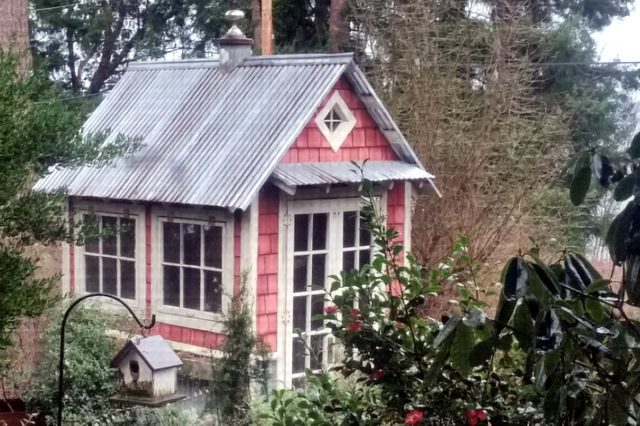 Few can resist a tiny shingled beauty with antique windows on three sides, French doors, and a weathervane perched on a tin roof. 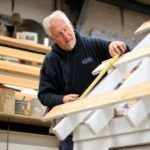 Bowling has been filling custom orders for playhouses and other small structures for the past eight years. 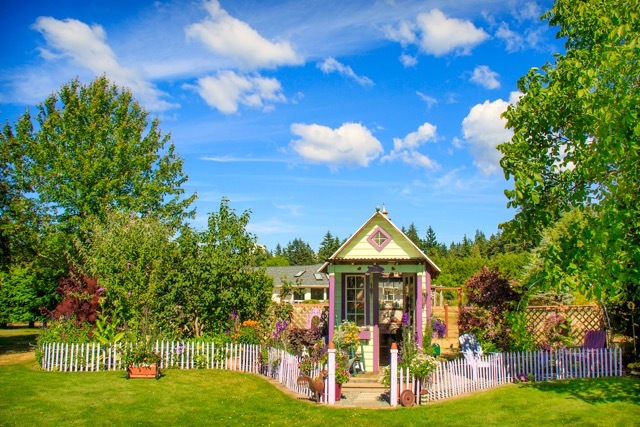 Alan and Charlene Cohen of Langley fell in love with the charm of Bowling’s tiny garden houses at the Bayview Farmer’s Market some five years ago. Wanting to create a sense of place in their backyard, the Cohens worked with Bowling to design and build a custom beauty with red shingles, the same shade as their house, French doors, awnings, and antique windows that opened out from the bottom. Cohen says it was impressive to watch delivery of the little garden house in her alley above Saratoga Passage. It arrived one day on the flatbed of a Hanson’s Building Supply delivery truck and was lifted by crane into their backyard. These days, Bowling is working around the clock, getting ready for the upcoming Northwest Garden Show at the Seattle Convention Center Feb. 22 to 26. There, he will join more than 300 exhibitors at one of the premier garden shows in the state. He’s found it to be a good venue to inspire future business. Located in Booth 302, one of Bowling’s stars of this year’s show is a rustic beauty perched on top of a vintage truck bed graced with an antique sink and yellow fenders. A lifestyle change brought Bowling to Whidbey Island in 2004. 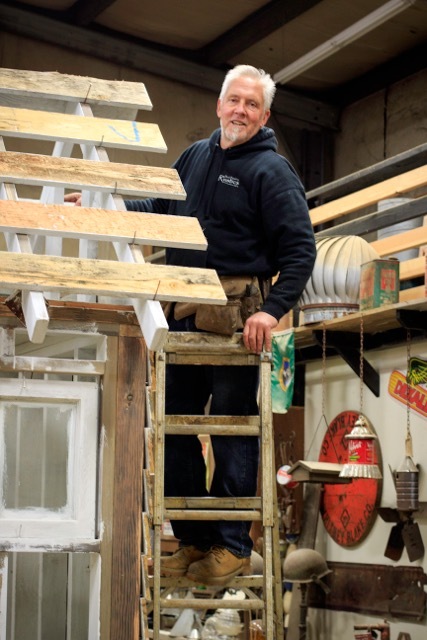 The former flooring contractor became an artist, designer, and builder of whimsical birdhouses and garden houses made of recycled and reclaimed material. 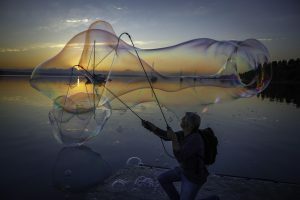 “If you had asked me 20 years ago if I’d be living on an island one day, I wouldn’t have believed it,” he says. “When I arrived here, I rented a barn from Sandy Whiting of Goosefoot to work in. Good people. A little over two years ago, I moved to my location here (at 5789 Bayview Road). Goosefoot did the lighting and remodeled it. It’s beautiful with the light coming in. Foraging for material at Island Recycling, Bowling finds old windows and doors, antique coffee cans, restaurant vents, and loads of other castoff things. 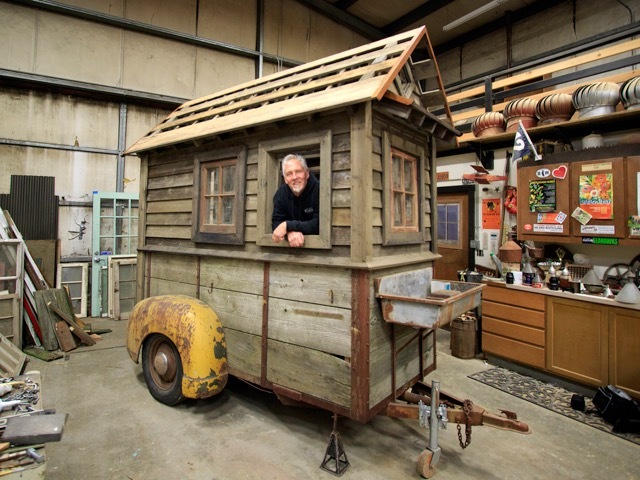 Using his imagination and construction expertise, he fashions the treasures into weather vanes, birdhouses, and bric-a-brac to adorn the facade and interiors of the garden houses or chicken coops. While the house accessories are typically made of recycled and reclaimed material, the framework is comprised of new lumber. “We want them to hold up in the weather,” Bowling says.